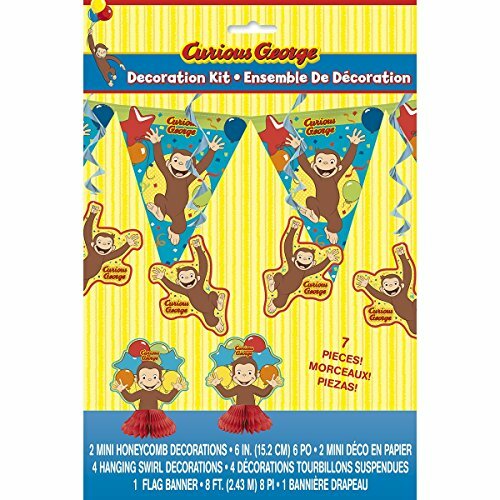 The Curious George Decorations were designed to pair nicely with a party theme featuring Curious George. These are a package of sixteen napkins that feature your child's favorite monkey. 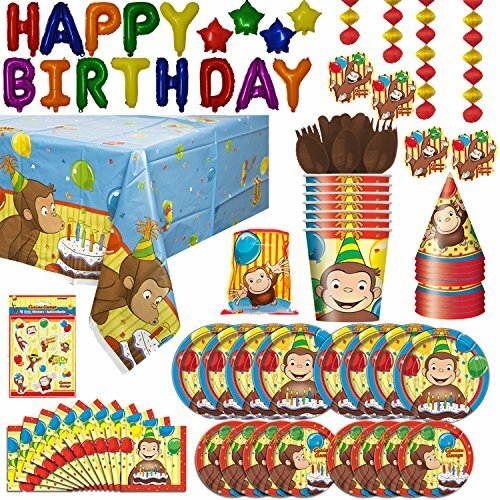 Wow your special birthday kid with the ultimate set-up using our spectacular Curious George Party Pack. The beloved troublemaking monkey is pictured on everything you need to set the table in style for a fan's birthday celebration. Enough for eight kids, this package has paper plates, paper napkins, paper cups, and one plastic tablecloth to outfit your whole party. All of the items picture the playful character, George, sweetly smiling as he jumps up for a hug on a background of yellow pinstripes and glossy balloons. From pouring a round of sodas to cutting the cake, this handy Curious George Party Kit has you covered. Best of all, cleaning up is a snap with the ease of disposable tableware. 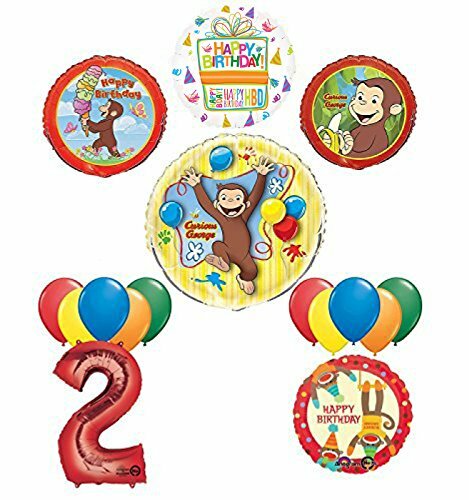 Finish the party off with balloons, streamers, or other Curious George decorations and party supplies. 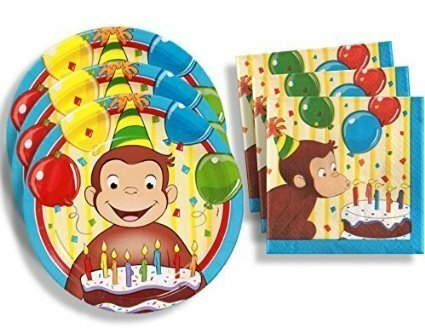 Curious George Party Pack includes 8 party plates, 8 napkins, 8 cups, and one plastic table cover. 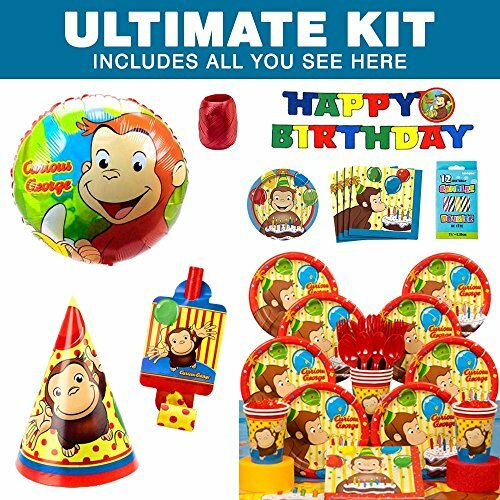 With this Kit you will receive: (1) 34' Curious George Round Foil Balloon, (1) 18" Birthday Present Balloon, (1) 34" Giant Red Number 2 Foil Balloon, (1) 18" Monkey Around Birthday Foil, (1) 18" Curious George Round Foil, (1) 18" Curious George Birthday Round Foil and (10) Assorted Standard Color 11" Qualatex Latex Balloons. Just add Helium and ENJOY! If you are curious about getting a great party kit for your child's Curious George party, just ask the man in the yellow hat. He'll tell you to get The Curious George Ultimate Kit. It makes party planning easy and fun. The all-inclusive kit comes with a box of candles, an 18" Curious George balloon, a Happy Birthday banner, 16 beverage napkins, 8 cake plates, 8 cups, 8 dinner plates, 16 napkins, 8 party blowers, 8 hats, a table cover, curling ribbon, 8 forks, spoons and knives, and streamers in red and yellow. 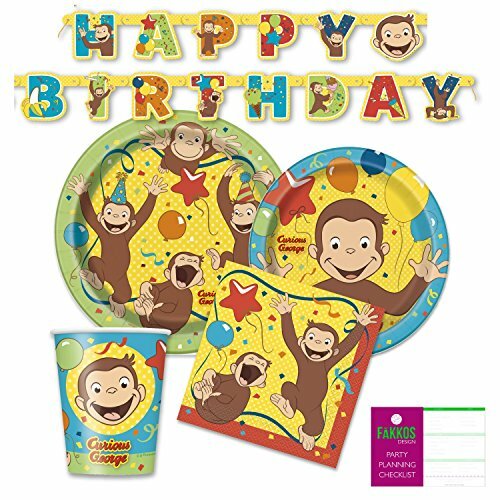 This Curious George Birthday Party supply pack includes the following disposable party supplies for 16 guests: (16) 9" round dinner plates (16) 7" round dessert plates (16) lunch napkins (16) 9oz paper cups (1) Happy Birthday Banner You'll also receive a unique FAKKOS Design Party Planning Checklist to help get your party organized so you can enjoy the party too! Curious George Birthday Party Standard Kit for 8 guests. 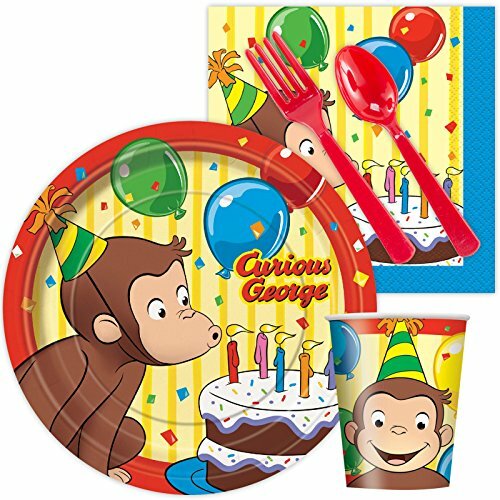 Party set includes 8 Curious George cake plates, 8 Curious George Cups, 16 Curious George Napkins, and 8 each plastic forks, spoons, and knives. 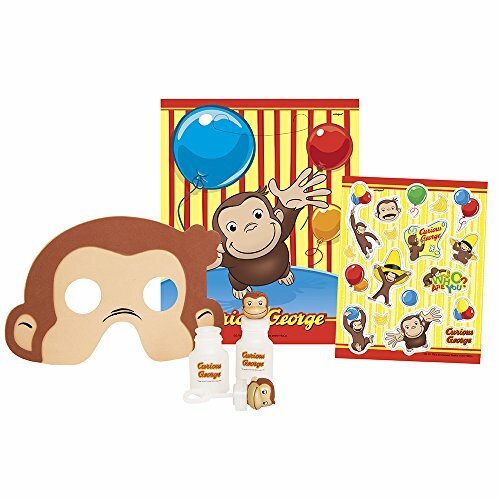 Ensure your little one's next birthday party will be more fun than a barrel of monkeys with our Curious George Favor Kit for 8. 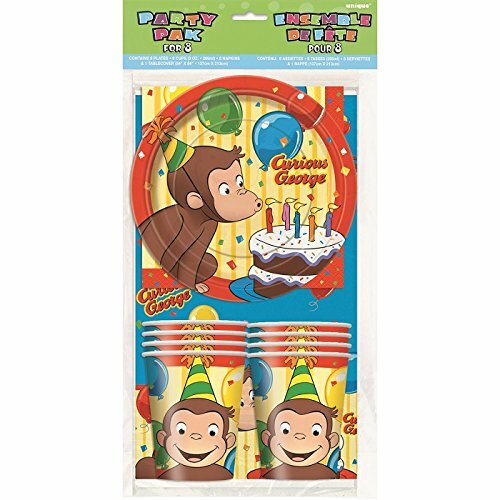 This convenient party favor kit contains an adorable assortment of giveaways to send guests home from your child's Curious George birthday party with more than lasting memories. Fill the included favor bags with the accompanying Curious George bubbles, foam masks, and sticker sheets, and throw in some candy and other treats to thank partygoers for making the guest of honor's big day so special. 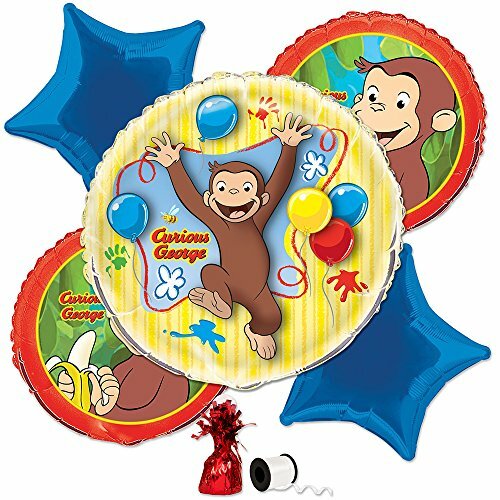 Compare prices on Curious George Party Supplies Kit at ShoppinGent.com – use promo codes and coupons for best offers and deals. Start smart buying with ShoppinGent.com right now and choose your golden price on every purchase.